In this powerful K-9 crime thriller, FBI Special Agent Meg Jennings and her trusted search-and-rescue Labrador, Hawk, must race against the clock before a diabolical killer strikes again. Somewhere in the Washington, D.C., area, a woman lies helpless in a box. Beneath the earth. Barely breathing. Buried alive. In Quantico, the FBI receives a coded message from the woman's abductor. He wants to play a game with them: decipher the clues, find the grave, save the girl. The FBI's top cryptanalysts crack the code and Special Agent Meg Jennings and her K-9 partner, Hawk, scramble to the scene of the crime. Cryptic clues lead them astray and by the time they solve the puzzle, it's too late. But the killer's game is far from over. Soon another message arrives. Another victim is taken, and the deadly pattern is repeated-again and again. Each kidnapping triggers another desperate race against time, each with the possibility of another senseless death. That's when Meg decides to try something drastic. Break the Bureau's protocol. Bring in her brilliant sister, Cara, a genius at word games, to decipher the kidnapper's twisted clues. Meg knows she's risking her career to do it, but she's determined not to let one more person die under her and Hawk's watch. If the plan fails, it could bite them in the end. And if it leads to the killer, it could bury them forever. Author bio: Sara Driscoll is the pen name of Jen J. Danna and Ann Vanderlaan, authors of the Abbott and Lowell Forensic Mysteries. Jen is an infectious disease researcher at a cutting edge Canadian university near Toronto, but loves to spend her free time writing the thrilling and mysterious. Ann lives in central Texas with five rescued pit bulls, including Kane, now a certified therapy dog. She also trains with Kane for competitive nose work. 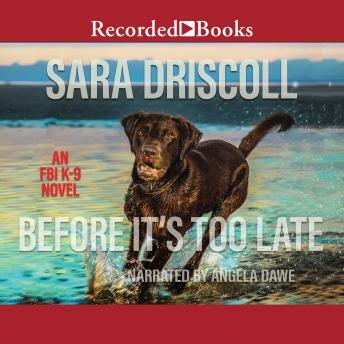 You can follow the latest news on the FBI K-9 Mysteries at www.saradriscollauthor.com.